I seldom sit at my computer or writing desk with a cup of something by my side. Iced tea, iced coffee or the hot versions of either. As I write, my daughter is preparing some chai tea for me in the new tea pot my friend bought me for Christmas. 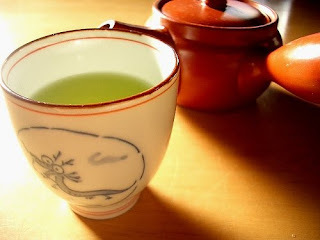 I love hot tea in evening or afternoon when the weather is cold outside. Does any thing beat curling up with a new book in one hand and a hot mug of a favorite brew in the other. All the big chain bookstores do booming business in their coffee shops with over priced and over fattening drinks. But we buy them anyway. Coffee and books seem to go together. I've never conducted a poll of my fellow writers but I'd bet many of them have their favorite mug filled with their steaming caffeine of choice on the corner of their desk. How many of them received gifts of new coffee mugs or flavored tea bags for Christmas? How many of them found a gift card to Starbucks in their stocking like I did? The end of the year, a time for setting goals for the new year, brings cold weather to our part of the world. As I plot my next novel, outline my promotion plans and listen to my new ipod, I'm sipping on my delicious chai tea. Later this evening when I delve into my C.J. Sanson mystery, Sovereign, I change my drink of choice to wine. How about you? Do you love a particular hot drink or other beverage while writing or reading? Does it change with the seasons? Old Man Winter's surprise appearance forced the postponement of today's booksigning, which was to have been held at The Midtown Scholar in Harrisburg. Until yesterday, forecasts seemed to call for only a dusting. 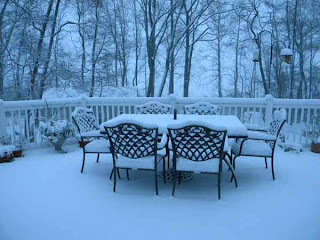 As you can see in the photo from my deck, already about three inches have fallen, and it's only 7:30 a.m. The brunt of the storm is supposed to hit later this afternoon. So look for more news on the rescheduled event in a few months. After the thaw. Meanwhile, I'll be serving hot chocolate on the deck, if you want to brave the storm. The Fourth Wednesday Writers Group meets at the Camp Hill Barnes and Noble from 6 - 9 pm on (that's right) the Fourth Wednesday of every month. Normally we spend our time critiquing each others writing and helping one another improve our products. However, with the upcoming conferences (Greater Lehigh Valley Writers Conference in March. and Pennwriters in May) we'll spend our meetings in February and March helping writers perfect their pitch. Mike Silvestri will lead the discussion in February on how to effectively pitch your novel to an agent or editor. Then in March, we'll give each writer a chance to practice what they've learned. You normally get about five minutes to pitch your novel so you need to make every second count. This is a great opportunity to get ready to meet that agent or editor. It is recommended you have a completed novel so you're ready to send it in. So come on, what are you waiting for. Mike is experienced and ready to share that experience. Questions should be addressed to Mike or to myself, Don Helin. Good luck and get ready to come out pitching. The New York Times' 100 Notable Books of 2009. Sometimes the review itself is a great read, such as the one for Follow Me: A heroine bent on reinvention is at the center of this densely stitched crazy quilt of a novel, which spans six decades and a wealth of genres while evoking a quintessential American mythology. How do you get a reviewer like that? I know, I know: write a great story. Two of my favorite authors apparently have - Alice Munro and Barbara Kingsolver, both on the list. Publishers Weekly posted several lists. USA Today listed the bestsellers, which doesn't necessarily mean a best read, to me. There's viral marketing, and then there's great writing. The Guardian UK published a list of what kept them turning pages and a "What not to miss" list. Amazon solely recognized that hey, 2009 isn't over yet! Its subhead's a disclaimer stating "so far." Which begs the question: do publishers avoid releases after say, October, knowing that the listmakers won't include those books in the "best" categories? And if you're taking a vacation in a balmy clime, you might want to check out NPR's best beach reads for the year. If you're the kind of person who cross-checks lists thoroughly, check out Large Hearted Boy's amazing compilation of lists. My TBR list always grows after reading these. As an author, of course I'd love to be listed, but more than that, I hope my writing touches readers' hearts and minds, and makes them want to read more. Sadly, I'm not on any of the above lists. But then, they're all for print. When I Googled "2009 best ebooks," the mishmash of results contained nothing related to the search. Maybe it's time for such a list. Not the individual "bestsellers" on each publisher's site. A comprehensive list encompassing all epublishers and genres, just like the print versions. It would be a leap toward respectability and recognition of the validity of ebooks. They're not going away anytime soon. It's misleading for only those print books also published as ebooks to be listed, given the rising sales of ebooks. So I'm putting out the challenge: let's have a "best ebook reads" list next year! Since we're in the middle of the holiday trifecta (TG, Xmas, and NYE), I want to take a moment to give thanks for all that I have received this year. I'm thankful for my family, my wife, Jenny, and our son, Logan. I never thought life could be so rewarding, but every day is better than the last. I'm thankful for our extended family; our parents, siblings, aunts, uncles, and cousins. So many have volunteered their time and energy to help us as new parents. It's marvelous to witness how Logan has brought our entire family closer together. I'm thankful for Lou Anders and Pyr Books for giving me an opportunity to share my writing with the world. One of my main New Years wishes is to make them very glad they chose me. I'm also grateful to all the other publishers who have taken on the book, and to all those who jump on the Shadow-Train in the coming year. I'm thankful to my agent, Eddie Schneider, and his (professional) partner, Joshua Bilmes, at JABberwocky for taking in a poor wretch like me. Likewise, I aim to prove myself a wise investment of their time and talents. I'm thankful for our friends, for their love and support. They make our lives richer. I hope all of you have a safe and merry holiday season, and a wonderful new year. So where are those hordes of fans? The adoring public? A few people gaze at you and your sign. Several wander over, mostly to tell you about their dreams of being a writer. Your mom arrives, dragging a few friends in tow. You manage to sell, um, three copies? Count yourself lucky. Those are average first-time booksigning sales unless you're an exceptionally good salesperson who buttonholes people and convinces them to buy. Unfortunately, most authors prefer keyboards to conversation, so high-powered salespersonship is beyond their powers. They shrink as people approach the table and pray they won't have to come up with an opening gambit. So if you're a shrinking violet, how can you ensure that you have plenty of visitors to your signing (besides having your mom strong-arm her friends)? Try the old safety-in-numbers trick. The more authors, the more mothers to marshal friends to the table. The larger variety, too, will encourage more browsers. Who knows? Maybe one of those visitors (or more) may pick up your book. It's worth a try. Oh, and a little chocolate always helps. If it doesn't attract the customers you'd hoped for, you can use it as comfort food. The Susquehanna Writers are taking their own advice and banding together to brave the world of booksignings. You can meet many of us at the Midtown Scholar Bookstore in Harrisburg, PA, on December 19, 2009. Get autographed copies of romances, mysteries, self-help, thrillers, history, YAs, and more. And the Midtown Scholar offers the largest array of rare and used books between New York and Chicago. They have more than ONE MILLION secondhand and out-of-print books in all fields.You’ll find something to please everyone on your holiday gift list. So bring Mom, Dad, Sis, Bro, and even crazy Uncle Albert. We promise you a delicious holiday treat (if we don't eat it all first). A good incentive to show up early before all the the best stuff is gone.